Natalia Poklonskaya was born 18 March 1980 in the village of Mikhailovka, Voroshilovgrad Oblast (today Luhansk Oblast); later in 1990, her family moved to Yevpatoria in Crimea. Poklonskaya graduated from the University of Internal Affairs in Yevpatoria in 2002. Poklonskaya has a daughter, Anastasia, from her first marriage. Both of her parents live in Crimea where they moved from the Lugansk Region in 1990, when Natalia was 10-years old, and both her grandfathers died during the Second World War, with only her grandmother surviving the German occupation. Natalia Poklonskaya became the chief prosecutor of the annexed region of Crimea on 25 March 2014, after the Republic of Crimea seceded from Ukraine and joined the Russian Federation in 2014. 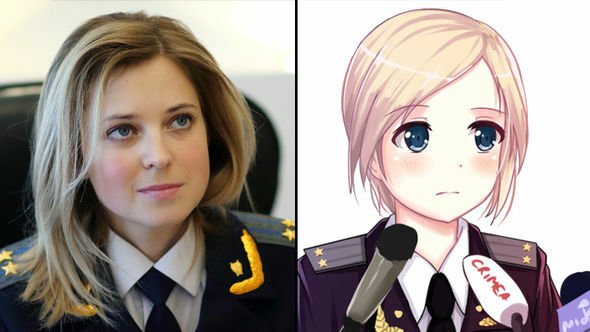 Poklonskaya immediately became an icon for many Japanese cartoonist and animators who were struck by her beauty and Russian anime fans nicknamed Poklonskaya "nyasha" (a cute, adorable person). Within one week of her appointment as prosecutor, many fan illustrations of Poklonskaya had been submitted to both Pixiv and DeviantArt, a sample is shown below. Despite her popularity on the Internet, the Crimean Prosecutor said she'd "rather be appreciated for [her] work" than her good-looks. A subsequent interview, taken by НТВ Channel on March 24 2014 regarding Natalia’s opinion on her unusual Internet-fame and her nickname she replied: “I am the prosecutor here and therefore won’t tollerate any nyashas-myashas!”. After Poklonskaya returned to Crimea she harshly criticized the Euromaidain protests and the new coup-installed Ukrainian government, which resulted in a criminal case against her in Ukraine and she was stripped of the rank of Counsellor of Justice. Poklonskaya is fond of sports and likes to keep active whenever she can. "Prosecutors should be fit and in good shape — she's an officer," Poklonskaya said after passing the all-Russian physical culture training program, abbreviated as GTO ("Ready for Labour and Defense"). She is dubbed as the “Iron Princess of Crimea” and in 2015 Poklonskaya announced that she would be running as an MP in the State Duma for the United Russia party; Poklonskaya was elected during the 2016 Russian legislative election. Poklonskaya resigned as Prosecutor General on 27 September 2016 due to her election as MP in the State Duma during the 2016 Russian legislative election. Prior to her resignation she was the youngest female general in Russia, at age 36.